Esther is so much fun and there are so many different applications! Tonight we are going to learn about a woman in the Bible called Esther. We can read all about Esther in the Old Testament book called Esther. There was a king named King Ahasuerus. He was having a great big feast (party or celebration). The feast lasted a long time! He invited his important people and servants to the feast. His queen was named Vashti. One day, the king was feeling happy and told some men to bring Queen Vashti to him, wearing her crown, so he could show his friends how beautiful she was. But, Queen Vashti refused to go to the king’s feast! You don't say no to the king! King Ahasuerus was so angry! The king's wise men told King Ahasuerus to make a new law. If the queen would not come to the king’s feast, then the king would give her royal position to someone else. He decided to find a new queen! All the beautiful women were gathered together and were brought before King Ahasuerus. King Ahasuerus liked Esther, and Esther was moved to the best place for the women in the palace. It took the women a whole year to get ready to go before King Ahasuerus! Once a woman went before the king, she couldn’t go before him again, unless HE called for her by name. 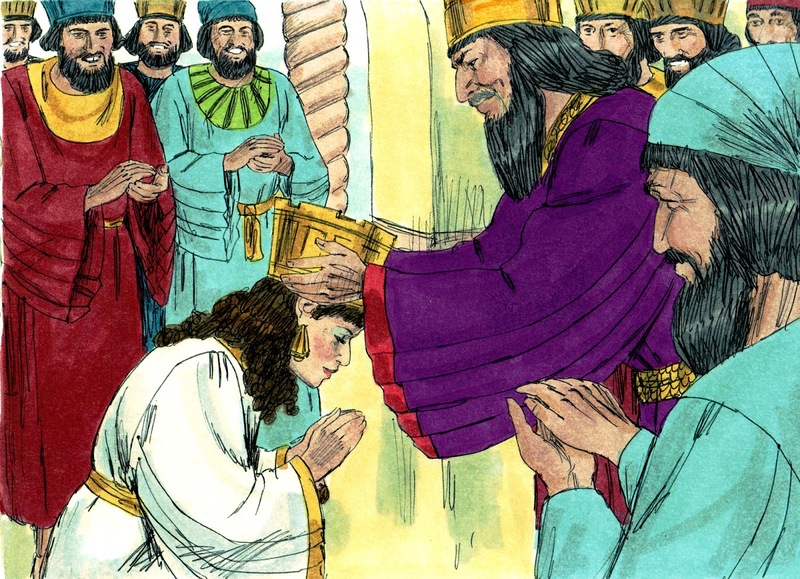 Four years later, Esther went before the king again. The king loved her more than all the other women. King Ahasuerus put the crown on her head and made her the new queen. Then Esther went to see the king. Remember, people were not allowed to go to the king. He had to call for them. She was afraid, but did the right thing for her people. The king held out his gold scepter and she touched the end of it. (I held out a scepter and let them touch it.) He told Esther that she could have up to half of his kingdom! But, she just wanted to save her people. With Esther’s help, the law was changed and her people were saved! Queen Esther was faithful to God and she was well liked and considered great among the people. Lesson found in the Old Testament Book of Esther. I told the kids that we were doing something a little different for this lesson. We prayed, sang some songs, then they were allowed to eat a snack while I told the lesson. They all said they were hungry and thrilled to have food. I only bring in food when it applies to the lesson. I set the table with different crackers, Fruit Loops, cheeses, grapes and small bottled water. They enjoyed the 'feast'. I gave them beaded necklaces when we reviewed about Esther getting ready to see the king. They had their crown and the scepters I made. I made these a bit smaller than I usually do for my second grade classes. I bought the long dowel rods and cut them into 3 sticks. I glued these caps onto one end. I used this paint to make them gold and they loved them. I always give a speech about "It's not a sword or a stick. Do not hurt anyone with it." The review project I created for Esther is this scepter. You print (cardstock will work best) the one page color or black and white, cut and glue the ends together to make the scepter. The students will glue the pictures in order onto the scepter. (I put mine through a sticker maker and they put them on like a sticker.) There is a completed teacher's visual included also. Click here to print. I decided to create crowns for the king and queen lessons in this series. I kept them simple for preschool and because I will let them attach gems to them. This is an updated crown for this series. You can find the original below. They include color and black & white. Click here to download Queen Esther. Click here to download the above lesson. I totally changed this lesson when I was reviewing it just before class. What you read above is how I taught it. If you want the original shorter lesson, click below. Click here to download the original short lesson. Click here to see more Esther ideas I used at home to study Esther. Click here to see Esther part 1 for early elementary. Click here to see Esther part 2 for early elementary.